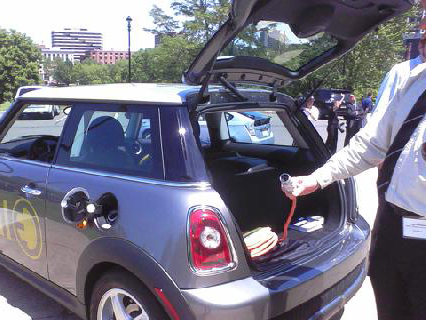 The Governor’s ready to drive a plug-in hybrid. Today’s REVI Forum in Hartford, CT (for Regional Electric Vehicle Infrastructure) provided inspiration and fodder for several blog entries, so I’m feeling a burst of energy. Panelists representing utilities, regulators and policy makers discussed an “EV readiness roadmap” which aims to support car charging for vehicles rolling out within the next couple of years. Six auto manufacturers also gave presentations – Nissan, BMW, GM , Ford, Mitsubishi and Toyota – and some brought vehicles along. This Mini’s connector is not the current J1772 standard (but I’d still like to drive it). 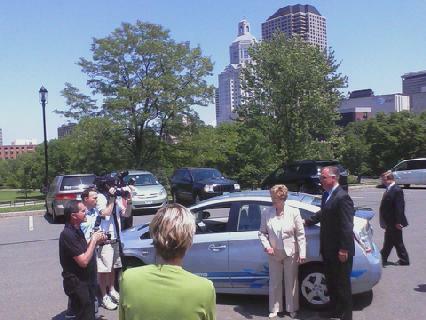 Connecticut Governor M. Jodi Rell got a ride and photo op (challenging the CA. Governator for EV supremacy, perhaps?). For charging services, however, everyone’s looking to the home garage to provide “early adopters” with electron fuel. Where does this leave enthusiasts living in condo complexes and apartment buildings? Hmm… will see see extension cords dropping from 3rd story windows? Drivers pulling juice from street light poles? Perhaps I overestimate the pent-up market here, but the auto companies seem poised to ramp up volume, and with unknown barrels of potential gasoline spewing into the Gulf, it seems to me that consumer demand could quickly outstrip utility readiness. So much credit goes to REVI chair Watson Collins, of Northeast Utilities, for putting the forum together and drawing attention to issues.